Name, age, hometown: My name is Brian Phillips, I'm 20 and I live in Kennewick, Wash. What corps are you in and what is your role this summer? I am in the Seattle Cascades, and I am the quad line section leader. Give us your full drum corps/marching music background. In high school I marched all four years. Freshman year I marched bari sax, then sophomore year I played bottom bass, then snare the last two seasons. I marched bass 5 with Cascades in 2002, and quads in 2004 and this year. I will age out next summer. Other than that I taught at Kennewick High School for the last two years (I arranged their percussion music last season). 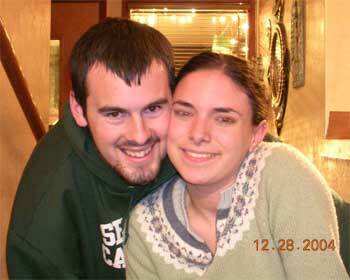 Brian Phillips and his girlfriend Emily. How did you decide to be a member of your corps? The Cascades were first introduced to me by my friend Derek Munson that marched in 1999. He told me how cool it was and that I need to go to the Seattle show. We went to the 2000 Seattle show and I remember only three performances -- Impulse, Santa Clara Vanguard and Cascades. So since I was brand new to drumming I kinda ruled out Vanguard tryouts for 2001 and went up to the Cascades. I made the drum line but had to have elbow surgery that summer so I didn't start marching until 2002. After that I just decided to stay with them -- I love the corps and the people, so I will stay there through my age out season. What first attracted you to the drum corps activity? I loved standing in the parking lot of the Seattle show in 2000 and watching all these cool drum lines warming up. But it was the feeling of a good bottom bass hit that sold me -- I told my friends who were with me that I wanted to play bass 5. I liked being the thump in the drum line. I also loved Vanguard's ballad in 2000, "Adagio for Strings," and I really liked the last chord -- loud things are way cooler than not loud things! What advice would you give to young people who want to march? Just show up to tryouts -- and don't worry about how good you are compared to everyone else. If you make it, great -- if not, take what you learned about that corps style and work on it. If you keep going, you'll probably make it. The last good book I read: Dang it -- I saw this question on other ones and always felt bad because I don't really like to read. But in all honesty, I loved my "Rules for Writers" handbook. It bailed me out of a lot of MLA errors and I wouldn't be the man I am today without it. The last great film I saw: The last "great" film I saw was (ohh and I just noticed that the word saw is just was backwards -- and you all totally just looked to see if I was right. I SAW you) "Anchorman." That movie is way ahead of its time. I can't believe some people I know don't like it. I wrote a six-page essay on how that movie shows serious gender bias in the late '70s and how we can all learn from it -- and I got an A-! Where I go to school and what I'm studying: I go to Columbia Basin College (also known as high school part two) and am working towards my associate's degree. Next school year I will go to Spokane Falls Community College and finish my associate's degree. Then it's off to Eastern Washinton, to get my music education degree. Jobs I have/have had: I am the front door guy at the local Best Buy. If you have a receipt problem or a customer complaint, I'm your man. And God help you if you dare steal! But for three years before that I was a mentor for an after school program to help at-risk children stay off the street. Three albums I'd want on a deserted island: Dave Matthews Band, "Live at the Gorge"; Best of the Seattle Cascades 2002, 2004, 2005, 2006; and a motivational CD telling me everything is going to be all right, narrated by William Shatner. My favorite TV show: "Family Guy" is number one, it doesn't get any better than that. But it's not on all the time so in between shows I watch "The Daily Show," Conan O'Brien, "Sportscenter," and if I need a really good laugh, CNN. Favorite performers: Dave Matthews Band (cool stage presence), and most any drum corps (see questions 3, 4, 5 and 7 for details). How do you "blow off steam?" Usually a good conversation with someone will calm me down. Ummm, hangin' out with people that make me laugh -- I've found that the best solution to people that make you angry is people that make you not angry (ohh man, that's going to be in my book someday). What has been your formative drum corps moment? Probably Finals night 2002, after retreat, handing out medals and taking pictures -- that was really cool. That was the climax of a really great season. Best drum corps show ever: This question isn't fair. I love a lot of drum corps shows -- like last week I listened to 7th-13th place corps from 2001 and I loved some of those shows. But to name some I would say, Star '93, Vanguard '89,'92,'97-'04, Cascades '99-present, Cavies '99-present, Some Blue Devils stuff, and I am getting into Phantom Regiment. But the coolest shows off them all happen before every show out in the parking lot. What are you most looking forward to about the summer? I am looking forward to losing 40 pounds again, sweating in my eyes, going to the hospital for an infected big toe, being wakened in the middle of the night by my entire leg cramping up and trying not to yell so I don't wake up the whole corps -- and having garlic pizza bread! Best thing about being in a drum corps: I love to watch the audience stand up the last couple seconds of your show -- it's like our own perfect wave made up of humans instead of water. I also love playing clean, that's where you find the best scores. Ohhh and one can't forget the bus rides -- man I love how close people become on the bus, buses are a great invention for drum corps, without them each corps would have 50 vans -- and that's not good for business. During tour, the best part of the day is: I like to fall asleep and not wake up until I hear the buzz of warming up gym lights. I also like to become clean and wear comfortable clothes while talking to close friends. But rehearsals are cool too. During tour, the worst part of the day is: Getting yelled at for messing up something you just did right like five times in a row -- and having to do it AGAIN! Favorite drum corps personality and why: I like how tall Tom Float is. What I want to be when I "grow up": I want to be the music teacher that can play every instrument and demo stuff for everyone -- my high school band director did that and I always admired that. I want to be the ridiculously-good-at-everything-and-can-play-circles-around-all-my-students-while-not-being-egotistical-but-respected-at-the-same-time music teacher guy. Describe what you think a typical DCI show will look in 2015. It will have lots of fire, big LCD TVs, each show will be narrated by James Earl Jones, and tie breakers will be decided by a battle royal between a representative each corps sections (guard, brass, and drums). And the crowd will have scorecards like at slam dunk competitions. Feel free to add anything else you'd like. Does the thought of giving a complete stranger goose bumps scare you? If not, then show up to a camp near you next season and live the dream -- you'll never regret it!